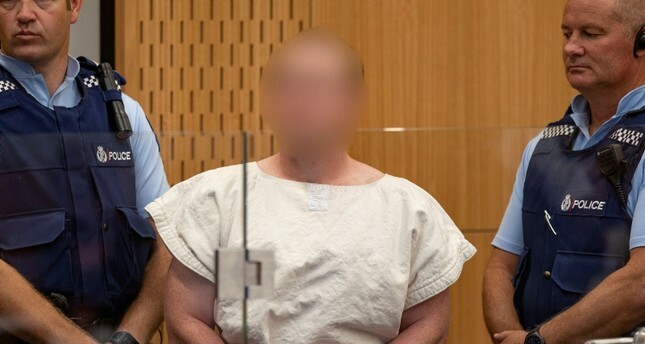 The alleged New Zealand mosque attacker made several donations to far-right "identitarian" activists in Europe known for their anti-immigration activities, Austrian daily Der Standard reported yesterday. The terrorist made donations in 2017 and 2018, the daily said, citing security sources from Germany and Austria familiar with the investigations. In 2017, the Australian made four donations totaling 2,200 euros (approximately $2,500). Sources quoted by the paper with knowledge of the probe in Germany said the money went to the French "Generation Identitaire" group. However, Austrian domestic intelligence was still probing whether the money all went to a group in a single country, the paper reports. The Christchurch mosque terror attack became the latest example of growing far-right terrorism, a well-known global threat. The terrorist left a manifesto behind which showed that the attack was motivated by deep-rooted anti-Muslim and xenophobic sentiments often targeting Turks in Europe. The terrorist also visited Turkey twice in 2016 according to Turkish officials, who said they were evaluating the possibility that the terrorist would have come to the country to carry out a terror or suicide operation. Tarrant also donated 1,500 euros to Martin Sellner, the leader of the Identitarian Movement Austria (IBOe), in 2018. Sellner, whose apartment was raided last week after authorities became aware of the link, has admitted receiving the donation but has denied having had any contact with him. Austria, which is governed by a coalition including the far-right Freedom Party (FPOe), is now probing whether the IBOe is a terrorist organization and as such could be disbanded. FPOe politicians, including Vice-Chancellor Heinz-Christian Strache, have also moved to distance themselves from reported links between FPOe and IBOe members. France is also studying whether the Identitarian group there can be disbanded over a recent anti-immigration stunt on a roof of an administrative building in a Paris suburb.